← Nana's Cookie Giveaway Winner – Alisa from Go Dairy Free! We eat a lot of hummus around here. I’ve never bothered to post a recipe, because, well, I just throw stuff together in the food processor and keep adjusting until it tastes “right.” We like our hummus fairly thick. Check out the photo here. That’s about the consistency of the hummus we typically make. Why is this important? Because today’s recipe has all of two ingredients – hummus and flax seed. But, it won’t work if your hummus is the really runny kind. You see, while we make a lot of hummus, we’re not always the best at eating our leftovers. And, far too often, that last bit of hummus sits in the fridge, all lonely and forgotten, until it gets scraped into the garbage disposal with the rest of the leftovers that I swear breed in our fridge. But, now there’s a way to use it up, and it couldn’t be simpler! Mix ingredients together until you have a stiff ball of “dough.” Place ball of dough on a sheet of parchment on a cookie sheet. Pat down into a rough square. Place another sheet of parchment on top of the dough, and roll dough with a rolling pin until fairly thin. Peel off parchment. Sprinkle dough with optional salt. Bake for approximately 15 minutes. Cut crackers into desired shapes with a pizza roller. Return to oven and continue baking until crackers are crisp – up to 10 more minutes. Your baking time will vary depending on the wetness of your hummus. Clearly, you can use any amount of hummus and flax seed you want – just make them equal proportions (by volume). Got some herbs lying around? Toss ’em in! Out of curiosity, do you consider flax seed a grain? It’s technically not a grain, and I don’t consider it as such, but some people do. Do you? Find this and more delicious gluten-free recipes at Simply Gluten and Sugar Free’s Slightly Indulgent Tuesdays. And, you can find it among a wealth of “real food” postings at A Moderate Life’s Two For Tuesdays. And, since these would be great in any kid’s lunchbox, I’ve also linked up with The Whole Gang’s Friday Foodie Fix – School Breakfast and Lunch! 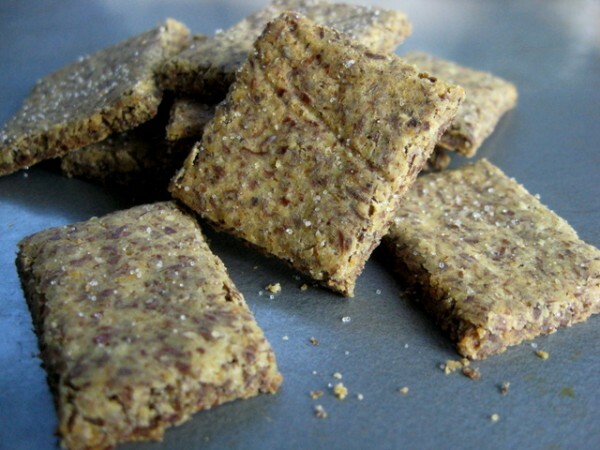 This entry was posted in beans, flax seed, grain-free, snacks. Bookmark the permalink. I put it in the nuts and seeds category. The fat content seems more similar to seeds to me than grains. I think of flax as seeds for sure!! Yep, they’re technically seeds. I’m sorry they kill your stomach Jessica. That’s a total bummer. I eat a ton of flax seed – some every day, typically. Do chia seeds work for you? Or hemp seeds? I’m wondering if either of those would be options in this recipe…. LOVE the idea! sounds terrific. Anyone who can’t eat flax might try chia or salba–the ratios are different, but it has a similar binding function, and an even better nutritional profile. I love both! Hooray, how exciting to see a recipe that is not only gf, but dairy and egg free as well. Good news for readers with food sensitivities. Thank you for sharing this recipe with Two for Tuesday. I love this idea! My 3 yo goes through phases where he wants hummus for 3 meals a day + snacks. Then after I have made a huge batch to keep up with demand, he decides that he will eat anything but hummus and I am stuck with several cups to use up or toss. Wow! These look fabulous. Great job. I must make this especially when I have hummus and ground flaxseed meal in my fridge. It is meant to be. Brilliant, brilliant!! I also make my own hummus and like it thick. . . and while we rarely, if ever, have leftovers, next time I’m setting aside 1/3 cup just so I can make these! Great recipe and can’t wait to try it! What a delicious way to keep food from going to waste – I love it! Thanks for linking this to Two for Tuesdays! These are so cool! I actually love how flax seeds taste, I think they’re delicious. 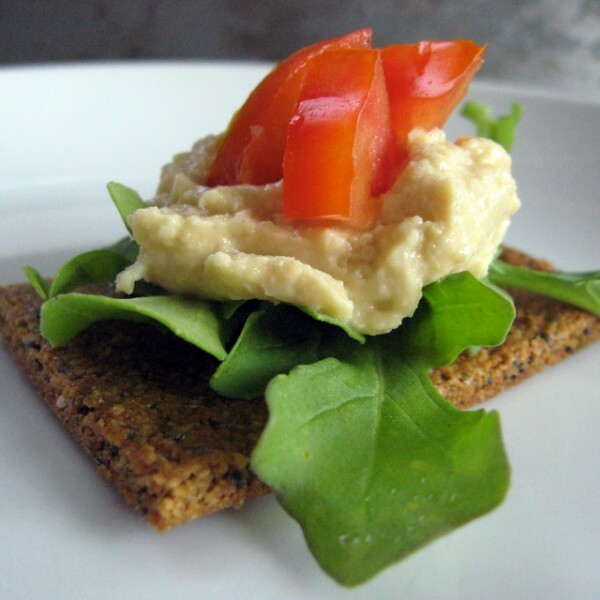 Hummus and flax… perfect combo. these are good. read the post, had almost exactly 1/3 cup of hummus in the fridge, went and made them, yum. Yay! I’m glad you made them Annette. Easy peasy, right? Deanna we are the exact same! There’s always some leftover hummus that gets thrown out. Not anymore! This is genius. Soooo healthy too. Thanks so much. Fantastically easy and yummy looking recipe, thanks! This sounds great! I have had to cut out hummus beacause of the raw garlic (breastfeeding and baby HATES it), but this seems like a great way to sneak it back in and be healthy to boot! Awesome! Oh WOW…consider me impressed! Though I have the opposite problem with leftover hummus (there never IS any! ), this looks like it’s worth saving some for. I LOVE thick, hearty crackers like these look to be. Thanks Amber and Elizabeth. Glad you like the recipe and hope you get a chance to try it! I love this recipe! So simple, so healthy, so genius! These are in the oven now. But what to eat with them…more hummus? LOL Thanks for the idea! Ellen – Sure – why not! Or some Muhummara would be good, too!